I remember as a child my mom took care of all her kids she has 7 of us by the way and back then I was too little to understand what it took to provide, care and manage us kids. Today, looking back I ask myself how she did it from feeding, clothing and being strong enough to handle everyday stress for us kids. 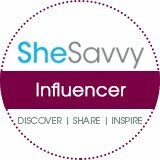 As you may realize everyday moms wake up and take on the challenges and are willing to do what it takes to fight an uphill battle for their family with courage, strength, and determination. Mother’s Day is May 13, 2018, and Teleflora “Love Makes a Mom” campaign which is part of the “Love Out Loud” platform. This Mother’s Day, choose from the following bouquets to show mom she is loved and is not forgotten by her unconditional love and just being there. 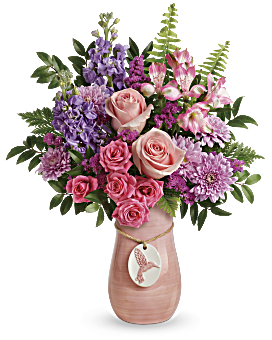 Winged Beauty Bouquet is a bright pink bouquet that is arranged in this glorious hand-glazed ceramic vase, complete with artisanal, brush-stroked finish and charming hummingbird medallion. 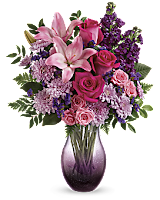 All Eyes On You Bouquet has hot pink roses, pink spray roses, light pink Asiatic lilies, purple stock, lavender cushion spray chrysanthemums, purple sinuate statice, huckleberry, and leatherleaf fern in a vase made of hand-blown, one-of-a-kind bubble glass vase with soft ombre shades of purple and plum. 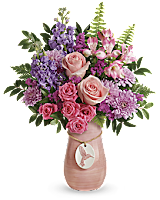 Country Beauty Bouquet has hot pink roses, pink spray roses, pink alstroemeria, light yellow miniature carnations, sword fern, spiral eucalyptus, variegated ivy, and leatherleaf fern which arrive in a hand-glazed crackle finish and charming, etched bee motif in a delightful stoneware crock. 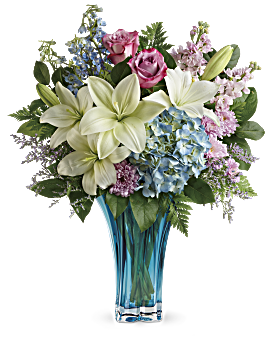 Heart’s Pirouette Bouquet arrives in an azure blown glass vase with blue hydrangea, lavender roses, white Asiatic lilies, light blue delphinium, light pink stock, lavender cushion spray chrysanthemums, misty blue limonium, leatherleaf fern, and lemon leaf. 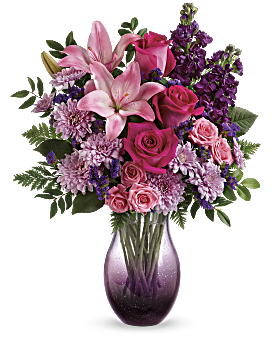 Wildflower in Flight Bouquet has a feminine and European charm in an alluring glass cube that is hand decorated and filled with hot pink roses, purple button spray chrysanthemums, lavender cushion spray chrysanthemums, white daisy spray chrysanthemums, raspberry sinuata statice, leatherleaf fern, and huckleberry. I got the Wildflower in Flight Bouquet which is very cute and arrived beautifully arranged mom will love this as it is cute but elegant.